Google kicked off its I/O conference in San Francisco yesterday by announcing a new version of Honeycomb, its next-gen "Ice Cream Sandwich" Android release, and their much rumored music service. But the company also offered a glimpse at its ambitious plan to turn homes into one network of connected devices and appliances. Powered by the Android @ Home framework, lighting systems could be controlled with an Android tablet, the thermostat adjusted presumably even while away from home, and multi-zone speaker systems fired up from a centralized point. In a sense all this is already possible through technologies like DLNA, and many companies are already building proprietary home automation systems around connected objects. But Google hopes Android @ Home will provide a unified client based on an open protocol for appliance makers to build on top of. Google showed off a couple of examples during the conference and announced partnerships with a handful of companies to bring compatible appliances and devices to the market. The first demo involved a LED bulb from Lighting Sciences Group that can talk to Android. It uses a new mesh network wireless protocol rather than Wi-Fi, ZigBee, or the other proprietary home automation protocols and can be controlled from a tablet or respond to certain events. "Lighting is very visible and prevalent so it made sense for it to be first foray for the platform," said a company spokesman. "Every one of the lights has a radio integrated inside the lamp so there's no additional equipment." The networked bulbs will be available by the end of the year priced roughly the same as general-purpose LEDs. Google also showed off a preview of something called "Project Tungsten," in which wireless speakers running Android pull music directly from Google's new cloud based music service and stream it to locations in the home. It also demonstrated a concept of how it can rip songs from a CD and store them in the cloud just by swiping a near-field communication-enabled CD case in front of the "Project Tungsten" setup. Wireless isn't the only way Google is expanding Android beyond mobile gadgets. Exercise equipment maker Life Fitness, for instance, developed a tool that allows Android devices to connect with treadmills, exercise bikes or other equipment via USB and download workout data to users' phones. 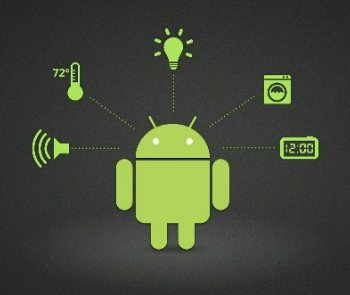 If the technology gets widely adopted by device makers the idea is to have Android as the operating system for your home. For now Google has unveiled the Android @ Home framework and the Android Open Accessory Development Kit (ADK) so developers can get a head start on building apps on top of the new protocols.